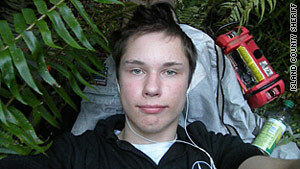 Colton Harris-Moore, accused of thefts on the West Coast, is now wanted in the Midwest. (CNN) -- The teenage fugitive accused of stealing planes, cars and boats along the West Coast is now wanted in the nation's heartland, police say. Harris-Moore, dubbed the "barefoot bandit" because he was without shoes when he allegedly broke into houses in Oregon and Washington, is suspected in a string of brazen thefts and break-ins in South Dakota, Nebraska and Iowa. Authorities in Madison County, Nebraska, issued an arrest warrant for Harris-Moore on Friday, court documents show. He has been charged with burglary and theft by unlawful taking or disposition. The affidavit supporting the warrant details a crime spree fitting the alleged pattern of the elusive teen, who has amassed thousands of followers on Facebook. Harris-Moore also is suspected of breaking into a home in Yankton, South Dakota, on June 17, police said. The residents returned early one morning to find the intruder inside the house, said Jerry Hisek, the Yankton Police Department's assistant police chief. "We're classifying him as armed," he said. Authorities say they suspect Harris-Moore broke into two airports: Chan Gurney in Yankton and Karl Stefan Memorial in Norfolk, Nebraska.